By providing sophisticated combustion technology, we, VOLCANO, contribute to decrease CO2 and NOX emissions, which cause global warming and air pollution and also develop low-carbon society and promote the effective usage of renewable energy measures by converting the disposal into fuel. Our goal is to contribute the preservation of the environment. This combustor enables the generation of a two-toroidal vortex by the introduction of combustion air through multiple nozzles from three directions. This combustion process realizes the complete oxidation of fuel to generate clean exhaust gas (Low NOx and CO) and is not influenced by increases or decreases by external pressure, or furnace load. 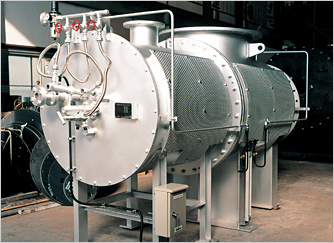 These outstanding characteristics distinguish the DT Combustor from other combustors on the market, and make it ideal as a thermal energy generator for production facilities like direct drying and as an auxiliary combustor for high pressure fluidized bed boilers and coal gasification furnaces. Low external-surface temperature and heat loss because the combustion chamber is surrounded by the air chamber. Stable combustion with low-calorific value oil/gases and general fuel. This type of burner performs the stable combustion by a swirler (swirl vane). By these features, this burner is applicable for the furnaces and incinerators which request a relatively large scale, high efficiency and low pollution. The fuel whose calorific value is over than 20,000KJ/kg or 8,500KJ/Nm3-G can be used as main fuel. Possible to design ideal flame shape depending on furnace dimension and its’ usage. Only to change the atomizing angle realizes the ideal flame shape, to Wide angle and Short flame from Narrow angle to Long flame and to satisfied the its usage. This type of burner performs the stable combustion by a swirler (swirl vane). 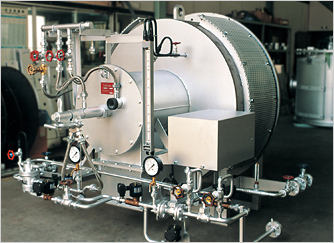 These features enables to be used for application to a wide range of incinerators, such as the fluidized bed boiler/free board burner for incinerators, various kinds of melting furnaces and other type incinerators. 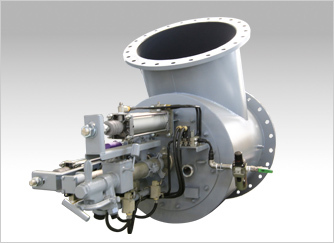 Swirl vane enables to keep stable combustion in the furnace pressure fluctuation such as fluidized bed boiler. 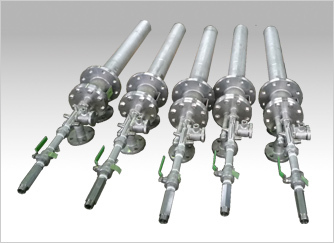 When the insufficient heat capacity of the main fuel and /or thermal wastes causes the drop of the furnace temperature in fluidized bed boiler and incinerators, this oil lance is used to spray supplemental fuel into the fluidized bed. Compressed air for light oil or vapor for heavy oil is used as atomizing agent to inject these supplemental fuels uniformly. Normally, multiple guns are installed to ensure that the temperature inside of the furnace is evenly. The structure and materal of the lance is designed to prevent friction and plugging caused by the sand. 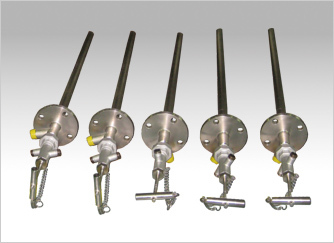 When the insufficient heat capacity of the main fuel and /or thermal wastes causes the drop of the furnace temperature in fluidized bed boiler and incinerators, this oil lance is used to spray supplemental fuel into the fluidized bed. Compressed air for light oil or vapor for heavy oil is used as atomizing agent to inject these supplemental fuels uniformly. Normally, multiple guns are installed to ensure that the temperature inside of the furnace is evenly. In the case the fuel is LNG, pilot burner and flame scanner shall be installed.